The Chandigarh Police today claimed to have achieved a breakthrough in the sensational triple murder case with the recovery of a blood-stained jacket from the Gurgaon apartment of Pawandeep, the elder son of slain Group Captain T.P. Singh. Even as the Punjab Government is spending crores of rupees to bring the 550-year-old Jayanti Devi temple at Kharar on the religious tourism circuit, the laid-back approach of the Punjab Police authorities could bring a bad name to the historic place. Liquor being illegally sold from a mobile vend near the Jayanti Devi temple in Kharar on Sunday. 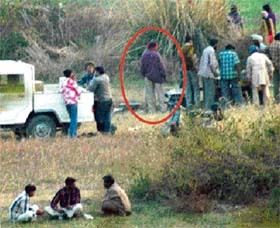 A policeman (encircled) is also seen standing near a makeshift ahata. Mohali residents today held a rally against the hike in water and sewerage charges in the township. Hundreds of residents gathered at the Phase 3-A park and raised slogans against the Department of Local Bodies for increasing the rates sharply. Serving soldiers, who were among those evicted from the Escorts Farm in Kashipur last month, are reportedly being denied allotment of alternate land by the Uttaranchal Government. Nor are they being considered for grant of compensation for destruction of their houses. Capture Indian foxes and breed them in captivity. 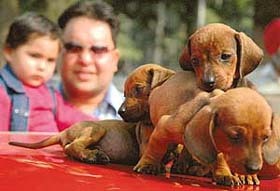 This is a programme to check their dwindling population. A proposal in this regard, prepared by the Mahendra Chaudhary Zoological Park, Chhatbir, has been sent to the Central Zoo Authority, New Delhi, for approval. A 24-year-old youth allegedly hanged himself to death at his Sector 43-B residence here late last night when his beloved reportedly got engaged to some one else. The police said though he held no one responsible for his extreme step, the family of the victim told it that he was in love with a girl, who was engaged elsewhere. Driving through Industrial Area may not be as hard. 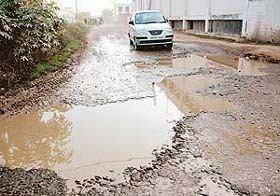 The long standing dispute between Haryana Urban Development Authority and the local Municipal Council over the repair of roads in Industrial Area here has finally been resolved. The government has now entrusted the work to the state PWD department. The all-India vice-president of the BJP and former Himachal Chief Minister, Mr Shanta Kumar, today flayed the Congress for its alleged “exploitation” of the backward classes for the past over 55 years. Much to the relief of the Railways authorities, around 30,000 candidates used special long-distance trains to reach the examination centres for the written test conducted by the Railway Recruitment Cell, Northern Railway, for Group D posts. 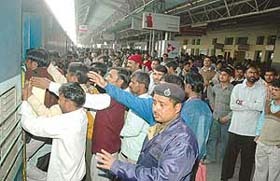 Candidates, who were in the city to appear in a test conducted by the Railway Recruitment Cell, Northern Railway, jostle to board a train at the Chandigarh Railway Station on Sunday. Rhythmic beats of thumping music were not required for them to display their grace. No one even missed the psychedelic lights as they paraded across the lawn with the elegance of a belle dancer, or else marched up and down with the dignity of a macho muscleman. A delegation of the Village Guest House Association, Chandigarh, met MP Pawan Bansal in connection with the move by the Chandigarh Municipal Corporation to seal the guest houses in the villages. The Minister of State for Finance, Mr Pawan Bansal today flagged off the “prerna yatra” organised by the Chandigarh Territorial Youth Congress from The Tribune Chowk. 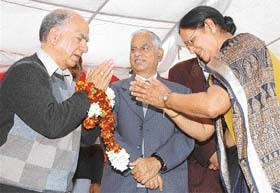 Punjab Governor and Administrator, Union Territory, Chandigarh, Gen. S. F. Rodrigues (retd), in a message on the eve of Parkash Utsav of Sri Guru Ravi Dass, today called for launching a crusade against discrimination based on caste, colour and creed and emphasized the need to work together for creating an egalitarian society. Leaders of the Joint Action Committee of various political parties today met the Union Minister of State for Finance, Mr Pawan Bansal, and demanded the regularisation of the houses in the Deep Complex, Hallomajra, and the scrapping of the “lal dora” for the villages in the Union Territory. The CBI Special Judge, Mr Jagdeep Jain, has directed the Chandigarh Police to produce the duty record of a constable, Rajesh Kumar, in a case of corruption registered by the CBI against another constable of the Chandigarh Police, Jaiveer Singh. The local police arrested four persons from Kheri Gujran village, near here, and recovered 17 bulls from their possession. Acting on a specific information, a police party raided a premises in the Kheri Gujran village and freed the bulls. Sahara One Media and Entertainment Limited today launched its innovative new movie channel, FILMY. 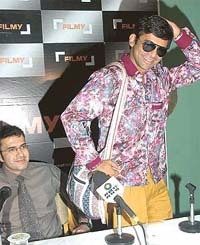 Launching the channel, Sunil Grover, an anchor with the channel, said with FILMY we hoped to redefine the way the viewers had perceived Hindi film channels over the years as it would present more than just movies to its viewers. Pecfest ’06 ended with a scintillating performance by Euphoria at the Punjab Engineering College grounds here today. The day witnessed a host of competitions. 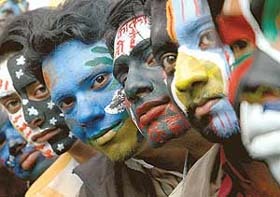 RIOT OF COLOURS: Participants at a face-painting competition, which was organised as part of the Pecfest in Chandigarh on Sunday. Here is a singer who knows his mind and doesn't mince words making it public. 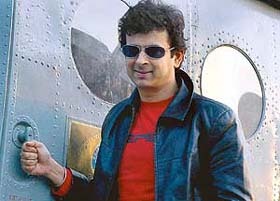 Palash Sen — leader of the music band, Euphoria, today said Pakistani music bands were eating into the Indian music market which should promote Indian talent. Pop star Palash Sen of the “Euphoria” band at the PEC in Chandigarh on Sunday. After last night's "War of the DJs", today turned out to be another fun-filled day at the ongoing Euphoria-2006 being organised by the Government Medical College and Hospital, Sector 32. Anshika Suri won the Chandigarh Spring Baby Show organised by Ajit Karam Singh International Public School, Sector 45 here today. Harsh Sharma was the first runners up while Jayant Aggarwal was declared second runners up. Woodlands House School, Sector 8, organised its annual show here on Friday. The programme started with ‘Ganesh vandana’. Pre-nursery children danced on popular old numbers and welcomed spring by singing ‘Out in the Garden’. A fine knock of 57 by Narinder Kwatra helped Chandigarh Advisers XI beat Chandigarh Press Club XI by 42 runs in the annual Samuel Banerjee Memorial cricket match at the Sector 16 Cricket Stadium here today. 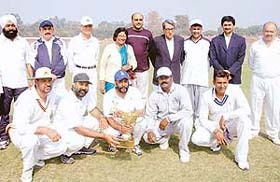 Members of the victorious Advisers XI after winning the Samuel Banerjee cricket cup at the Sector 16 stadium in Chandigarh on Sunday. Eight teams from Chandigarh, Maharashtra, Andhra Pradesh , Chhattisgarh, Mumbai A and B, Madhya Pradesh and Lucknow (NBSC) sailed into quarterfinals of badminton during Nabotsav being held at the Sports Complex, Sector 42, here today. A fine performance by Gaurav Chhabra (56 off 64 balls) and Arjit Gupta (30 off 41 balls) enabled DAV Senior Secendory School, Sector 8, Chandigarh to register an emphatic victory over Budhadal Public School, Patiala in the finals of PCA-Parle Cricket Cup Inter School Boys (under 17), held at PCA grounds, here, today. A fine unbeaten knock of 113 runs by Varinder Bhatia of Indian Express went in vain as the Indian Express team lost to the defending champions Amar Ujala by 7 runs in the opening match of the Airtel-Press Club Inter Media Cricket Tournament held at the St. Johns Cricket Ground here today. Sanket Sharma will lead the Chandigarh men’s team in the Senior National Archery Championship for men and women to be held at Jamshedpur from February 23 to 28. Jagandeep Kaur will be the captain of the women’s squad.